The Chicago Comic's Convention, at one time, hosted writers. That included comic book writers and words-on-paper for books without pictures writers. And we were stationed at the main entranceway at a long table as the con-goers passed en route to the dealer's area. What I remember in particular was being sat next to Jody Lynn Nye, and listening to her talk with a fan who said that one of her (Ms. Nye's) works was her (the fan's) favorite books, and Ms. Nye immediately quoting the first paragraph of that book verbatim. But for the most part it was relaxed and a little bit empty. A lot of fans would pass by us, desperately trying to not make eye contact. We got a few fans, but nothing major. Except for this HUGE LINE queuing up across the hallway. The line was for Harlan. Harlan had just published a book about the famous/infamous Star Trek script he had written - City on the Edge of Forever. And he had a LINE. A true, long, rock-star level LINE. All clutching Harlan Ellison books of various vintages. And, of course, we were a little jealous. And we joked about it, and then Harlan arrived. And he goggled at the line. Physically took a step back. And he looked at the rest of us, with our one-or-two-or-no fans chatting us up. And Harlan sprung into action. Harlan started HUXSTERING for us, the other writers. He went down the line and pushed for each and every one of us, telling the assembled masses (loudly) what great writers we were and how the fans should come talk to us. For those he knew he went on at length about their credits. For those he did not (myself included), he scanned the books in front of us and made something up. He went down the line, promoting each and every one of the writers, before taking his own spot and starting in a long, long signing session for the multitude of fans. And you know what? I had a couple fans come up (after talking to Harlan) who said that they came over because Harlan recommended me to them. So, yeah, I'm a bit of a Harlan booster. Totally unexpected. And appreciated. That's my Harlan story. The man was a story-teller, and could make a story out of mailing a letter. This is not an exaggeration - I was at an event where he went on at length about trying to mail a letter in Bellevue and not being able to find a mailbox, and anyone who knew what a mailbox WAS. He could be insufferable and offensive and kind and focused and angry. He was a real mensch and a pain in the tuchas. If you entered his orbit, you gave up any right to control the narrative. Gods help anyone who got in his way. And he was great writer. His stuff was in total reprint when I was in college in the 70s, there were acres of his various books out, including his non-SF and his cartoon captions. Everything. People later remember him for his TV work, like Babylon Five, and in his bi-ennial (once every two years or so) scandal or lawsuit or something out there that brought him a lot of attention, deserved or not. And now he's gone, but his stories are still here, filled with all the fury and vinegar accumulated through his life. They are a writer's immortality, really, after the lines dwindle and personal stories fade. Farewell, Harlequin. You have fought the good fight. The current Rep season kicked off with The Odyssey, an amazing production that celebrated the amateur, starring most of the Seattle zip code in an updated presentation of a elder great work. And we close with something similar - Shakespeare's Macbeth performed in a vacant lot by a troupe from a girl's school. There are differences - Odyssey was a full adaptation, while Mac Beth is an almost straight reading (Almost too much so, but more on that later). and while Odyssey embraced its amateur roots, the cast for Mac Beth are all-star rookies. Charlotte Schwieger in the title role has previous New York experience, but she and the bulk of the cast are making their Seattle Rep debuts, and many were involved in the MAC BETH Workshop at the Rep last year to work the play out. These are newcomers to the stage, making their first serious forays. Let me give you names, just so in future years you can can connect them to this particular time and place: Tamsen Glaser, Analiese Emerson Guettinger, Sophie Kelly-Hedrick, Izabel Mar, Laakan McHardy, Klarissa Marie Robles. All have their assigned roles (Banquo, Witch, Witch, Lady Macbeth, Witch, and MacDuff), but they fluidly fill in all the other tasks in the play (messengers, soldiers, kings, victims) as need. The young women, dressed in school cloaks and skirts that give off an Scottish vibe, gather in aforementioned vacant lot and put on a performance of Macbeth for their own benefit. They rush about and scream and check their cell phones. But they are also witches who greet Macbeth and make prophesies, old kings and violated trusts, weird sisters who call upon dark things. There is a transformation here as they dance between the lines of play and playing serious. The play warns of graphic violence (to which one responds - "Pfft it's Shakespeare! of COURSE there is graphic violence"), but once it descends you have to ask if these are truly girls but rather vessels possessed by the elder goddesses. I will be frank, it left me unnerved, but the Lovely Bride nodded and understood. Which made me even more concerned. Indeed, this is one of the best performances of Macbeth I have seen, including serious attempts of older adults armed with the text itself. They do not translate the text into the modern speak, and the anachronisms of selfies and texting are less intrusive than for many presentations of the Bard watched over the years. The girls are playing it straight, for good and ill. Bits of light stagecraft do not interfere with the play that is the thing. Macbeth is much-quoted, and the quotes are kept within. Its transformations of character within the text are touched upon, grasped by the actresses, and internalized in a way that I often do not see on the stage from elders. I am, as I said, troubled, by the border between play and utmost seriousness, between the real and the fictive, between the solid and the magical. The play is extended by a week, I've been informed, which is a good thing. It is an excellent ending to a very strong year at the Rep, one that zigged and zagged with risks like this and the Odyssey, with excellent original plays like The Great Leap and Familiar, With the familiar in Austen, August Wilson, and Irving Berlin. And with the occasional mis-step in The Humans. 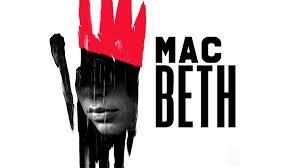 MAC BETH closes out the season, and is worth seeing. And being disquieted about. Lady Windermere's Fan by Oscar Wilde, Directed by Karen Lund, May 16-June 23, Taproot Theatre Company. The Lovely Bride received a flyer in the mail on this one, and expressed interest. I didn't say no, so I ended up in the theater in the Greenwood neighborhood on a Saturday afternoon. It a small neighborhood theater with a thrust stage, a balcony all around, and seats of the size that make you appreciate traveling coach class. Ah, but it is Oscar Wilde. Witty epigrams. Scouring the wealthy, pushing the buttons of morality, zeroing in on hypocracy. Fan was Wilde's first comedy (Salome, censored, was earlier, Earnest was later), and with it he locked in his place as playwright handling heavy matters with comic tones and subtler meanings. But to be frank, the play itself lurches forward uneasily to start. Wilde finds moral people to be dreary and tiresome, and indeed, at the onset Lady Windermere (Maya Burton) is exactly that - the sort of person dividing humanity into good and bad with herself on the positive side of the chasm. Married and with a young (never seen) child, she rejects Lord Darlington (Tyler Terise), who pursues her. Hers is a virtue untested, but when rumors begin to circulate that her husband, Lord W (Richard Ngyuen Sloniker) is having an affair with a woman of the "bad" quality (Nikki Visel as the fallen Mrs. Erlynne) does that virtue truly get tested. Worse than the rumors, the husband wants the wife to invite "that woman" to the soiree she to throwing and in doing so put the stamp of "good" society upon the newcomer. It feels a comfortable melodrama of unspoken reasons and chance discoveries. And to be honest, this is one of those plays where, if one simply explained what was going on (as you would, in, say, a healthy relationship - she confronts him, he explains fully), you'd have no play (or rather, a very different one), but no one gets the chance to, so the play unspools through the party in which Lady Windermere chooses to leave her errant husband. But of course things are not as they seem. The action picks up a bit in Act II when Mrs. Erlynne arrives at the party and there is much question of whether Windermere will toss her out, but the language only becomes truly Wildean in Act III, when the male characters start tossing epigrams and bon mots about the upper social classes and things shift into a more engaged, emotional mode. And in the end, stasis is restored, and all get their happy ending, though now with a touch of darkness. Both husband and wife keep are keeping secrets from one another, and that keeping of secrets keeps them together. Yep, it turns upon itself, and that is nature of Wilde's writing. There are a couple things I particularly like about the play. One is that the "big secret", the origins of Mrs. Erlynne, are revealed in the second act, with the rest of play being who knows what and how (and yes, there are moment when one in inwardly growling - "Just tell them, already", but it gets pulled off). The other is that there is no true villain per se, unless the requirements of society itself are said to be villainous (which Wilde is getting at). Each character has the chance to be rebel and villain, to be hard-hearted and understanding in turn, judgmental and protective. That continual turning gives his characters a lot more depth and nuance. The production is fine, the stagecraft solid. Ms Burton and Ms. Visel have to bear the bulk of the load for carrying the play forward. As you move outwards from their dualism, the other characters become more broad and cartoon-like, so they must hold the center. Mr. Solinker is good as well. The play benefits from its large cast, and actors move onto and off the stage quickly, capturing the flavor of the party and swelling its numbers further. Lady Windermere's Fan is not a Wilde play that is staged with the frequency of, say Earnest, possibly because of the large cast. The Taproot does itself well with it, and delivers a witty, ironic, and ultimately piercing version of Wilde. Provenance: Brain Thomsen, head of the book department at TSR back in the day, lent me a copy of this in the mid-90s. I enjoyed it a great deal, and after I returned it, I kept my eyes out for a copy. Never found one. It was one of these small press, single printings, and never saw it again (apparently, there is a Kindle reprint, because of course there is). In any event my colleague Sacnoth turned up with a copy he was giving away. He had gotten it from a colleague who was cleaning up his library, and my good old chum Sacky had gotten a spare. And because I was the first to speak up, I got the copy (beating out Stan! for it). Review: So how does it stand up after 20 years? OK. This was put together back in the age when mash-ups (as the kids are calling them nowadays) were pretty much the domain of fandom. The book itself is a series of well-known Lovecraft tails retold with Bertie Wooster as the protagonist. And they are surprisingly good, in that way that cheese and fish are not supposed to go together, but sometimes they are delish. H.P. Lovecraft wrote a particular style of story: florid in style and nihlistic in outlook, his protagonists rarely survived their brush with the unflinching, uncaring, overpowering mythos. P.G. Wodehouse wrote another particular style of story - light, comedic, well-mannered and veddy, veddy British. Wodehouse's best-known protagonist was Bertrand ("Bertie") Wilberforce Wooster, a well-meaning specimen of the upper class who regularly gets himself in a mess and who is saved regularly by his valet, Jeeves. So how do these worlds collide? Not badly at all. The world is Lovecraft's, but the viewpoint is Wodehouse's. And in the three stories, Bertie just misses the worst of the eldritch horrors that inhabit the Lovecraftian universe, usually through the efforts of Jeeves, but just as often through his own thick-headed nature. So he remains blithely ignorant of much of the proceedings, as well as their dire, cosmic content. There are three stories in the volume, plus an essay. Knowledge of the Cthulian canon is an aid, since they are based on three of Lovecraft's tales. "The Rats in the Walls" transfers into "Rats, Cats, and Bertie Wooster". "Cool Air" becomes "Something Feotid". And "The Rummy Affair of Young Charlie" should be a Wodehousterized "The Case of Charles Dexter Ward" but instead takes the protagonist of that tale and drops him into the plot of "The Music of Erich Zann", with a dash of Sherlock Holmes from "The Last Bow". References to Faulty Towers, Arthur Machen, and other Lovecraftian tales also abound, so that if you are an invested fan of an these, you will find the Easter eggs abounding. 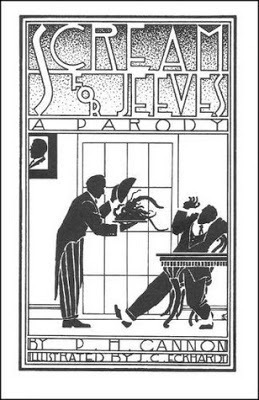 All the tales are illustrated in a 1920s style by J.C.Eckhard which both the flavor of Lovecraft and of Wodehouse and would be suitable for either Weird Tales or Milady's Boudoir. Lastly in the volume is an essay seeking to tie together Lovecraft, Wodehouse, and Sir Arthur Conan Doyle, which is a hit and miss affair. Cannon can line up two of his subjects on any point he seeks to make, but the third always seems to be a tough fit. 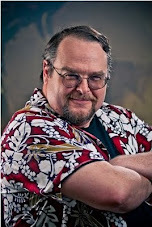 The great connection that I see, years later, is that the three authors have enjoyed a posthumous life through their creations, particularly in the gaming field. Lovecraft's creations thrive on the gaming shelves including a Holmesian adventure in the early Cthulhu by Gaslight set. Holmes himself lives on through a variety of remakes, reinventions, adaptations, lost stories, further adventures. And I have have created characters who bring the Code of the Woosters to the Realms (Giogi Wyvernspur and Tertius Wands) as well as placed a facsimile of the Drones Club in a Baker Street RPG. The inventions of these three creators continue to inspire, and the nature of the worlds they present are ripe fields for future creation.